Managing young minds that are extremely inquisitive and keeping them busy at the same time is a challenge every parent goes through. If you have more than one kid to handle, the challenge gets that much bigger. Engaging kids in activities that would improve their cognitive thinking and help them produce masterpieces is one of the most amazing ways to keep kids busy and let their creative juices flowing. Egg shells are fun to play with but require lots of concentration at the same time. When done right, this activity can keep your kids hooked for hours together. Take an egg; make a small hole on one end to remove the egg contents completely. Wash it thoroughly and allow the shell to dry. Once dried, ask your kids to take the shells and paint on them. They can paint funny faces, scenery or maybe even their favorite action hero or cartoon character. The ideas and possibilities are limitless. The outcome is fabulous. If you find whole egg shells a little cumbersome to paint on because of their fragile nature, you can always break the egg into two, empty out its contents, wash it thoroughly and dry it. Once dried, you and your kids can gently crush the egg shells into uneven pieces. Don’t end up crushing them too harshly, they would become powdered and get wasted in the process. Now, take a cardboard that’s been cut out in a rectangle and place generous amounts of glue on four sides. Place the broken egg shells on the glue and press them lightly but firmly until they are in place. Allow to dry. Once dry, your kids can paint the broken egg shells with whatever color they want. Allow to dry. 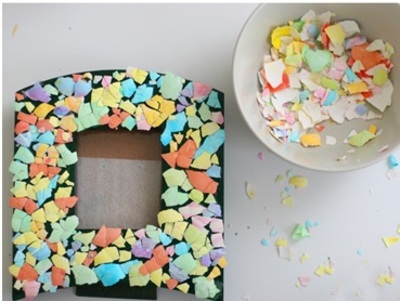 These egg shells would now look like a beautiful border to your photo frame. You can make your border thick or thin, depending on how you want it to look like. Once dried, place your favorite family photo in the center. Your very own photo frame is now ready! Take your kids out to your garden and make them pluck colorful flowers of different sizes and colors. Once you are back home, gently flatten out the petals and place the flowers in between the pages of a thick book. Place a heavy weight on top of the book and allow for it to stay for a few days until the flowers have completely dried. 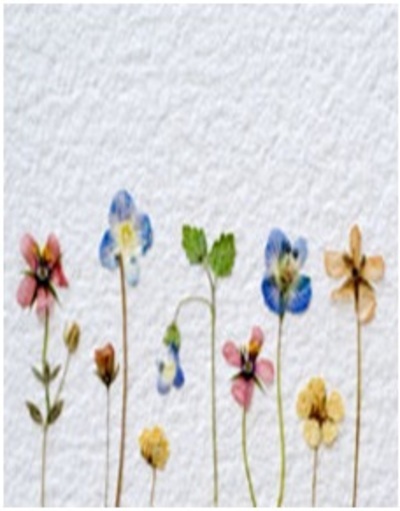 Once dried, gently take them out and make you kids paste these flowers on a thick sheet of paper that has been cut into a size of a greeting card. Alternatively, you can also cut out bookmarks in the same fashion. Make your kids glue the flowers in whichever manner they want. 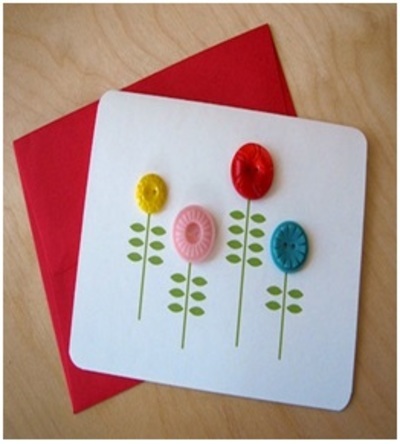 If you find the process of collecting flowers tedious, you can make use of colorful buttons on the greeting card as well. Eco friendly and customized greeting cards are ready! You might have glass jars left over in your kitchen. Instead of throwing them away, give them to your kids. Buy a glass liner and make your kids draw whatever pattern or design they want on the glass. 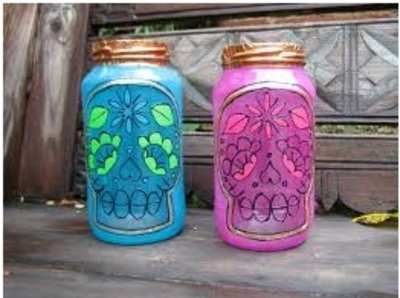 Once the outline has dried, your kids can use glass paints to paint the jars in mind-blowing colors. You can use these jars as a pen stand to place your kids’ pens/pencils/sketches in one place. This activity is not only interesting to do, but also doubles up as a storage box, helping you de-clutter your kids room in an efficient and beautiful manner. 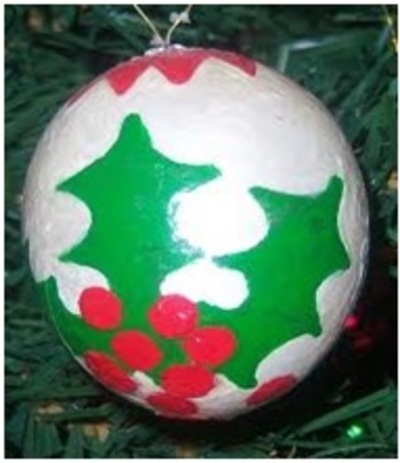 This activity is exciting, interesting and every piece is unique from the other, making them great keepsakes or gifts. Collect stones or pebbles that have a smooth surface. Make your kids wash them thoroughly to get rid of the sand and allow them to dry. 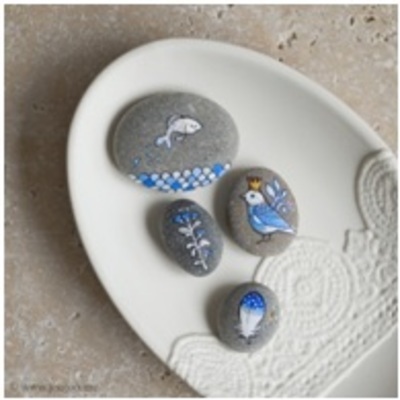 Next, they can use paints to decorate their stone/pebble with words or pictures. They can write their friend’s name or small messages and send it over to their loved ones. These gifts are special with a personalized touch, making them priceless. This article is written by Nasmira Firdous who blogs for Indian Art Kart, an online paintings, home decor and wall art store.